See-Dub: Parting is such sweet sorrow. A sweet lady and dear friend of ours died over the weekend. Some church friends knew her as Doey, but she was always Mrs. Giddings to us. Even though we knew she had been in poor health for a while and we hadn't seen her in ages, it was still so painful to hear that she had passed away. I met Mrs. Giddings more than 20 years ago when I was growing up in Tyler. When I was in high school, her son was our preacher at the congregation where I grew up. From time to time she would come visit, so when I moved to Fort Worth and found my way to Midtown, she already knew me and my family. There was something extraordinarily comforting about that. As I made friends and even later, as I got married and started my own family, she remained one of the few people I worshiped with who had known my dad. She would even mention him now and then, telling me how much she enjoyed his singing. How I loved to hear that! She also knew my mom. Later, after my mom's health declined so dramatically, Mrs. Giddings would always ask about her. Even though she had plenty of her own health issues, she would always check on Mama. 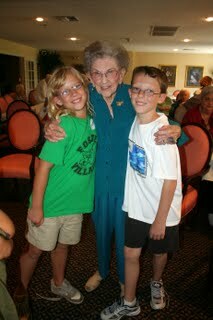 And of course, Mrs. Giddings was always so sweet to Ryan and Katie. She doted on our kids like nobody's business! If she saw me or Brett, she'd always ask where the kids were because she just had to love on 'em. This was true every single time we saw her! We felt like Mrs. Giddings was our special friend, our honorary grandmother. But what's wonderful is that there are LOTS of people at HCC who felt that way about her! She made everyone feel loved and special. She doted on us all. We're praying for the Giddings family as they mourn, and we thank God for blessing us with our sweet friend, Mrs. Giddings.